Electrotherapy uses electrical energy to promote healing, repair tissue and reduce pain. As with all physiotherapy treatments, electrotherapy is used alongside other treatments to achieve the best results. These include for example resistance exercises, massage, and hot and cold therapies. Electrotherapy can be delivered in many ways depending on what the therapist deems appropriate from their assessment of your problem. Transcutaneous Electrical Nerve Stimulation (TENS) – Application of an electrical current by means of electrodes placed on your skin to stimulate the nerves beneath, triggering the onset of your body’s natural pain relieving mechanisms. 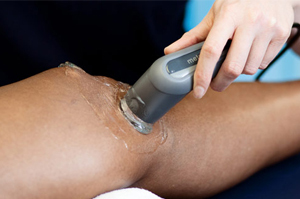 Ultrasound –This technique utilises high frequency sound waves to deliver energy to cells and improve tissue regeneration by basically boosting their function.